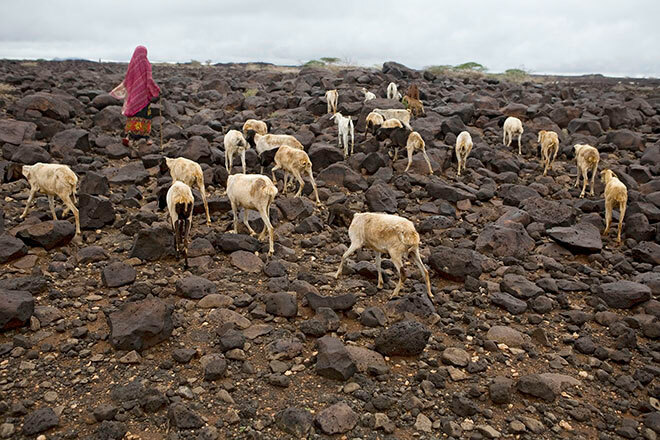 A Gabbra pastoralist herds her goats into the bleak rocky hillsides outside Kalacha. Due to the three-year drought, animals have to be taken long distances from water sources to find pastures that have not been overgrazed. Many do not survive the journey. The majority of these images were taken in 2006 when I travelled to Kalacha, a settlement in northeast Kenya, to look at the effects that drought and climate change were having on the Gabbra nomadic pastoralists. At the time, the region had been subject to a devastating three-year drought, leaving many of the Gabbra with drastically reduced numbers of camels and goats, and few means to survive. Strong rains finally arrived during my visit, but they had come too late to rejuvenate the pastures that might save their remaining livestock. By this point, many of the Gabbra were entirely dependent on food aid. 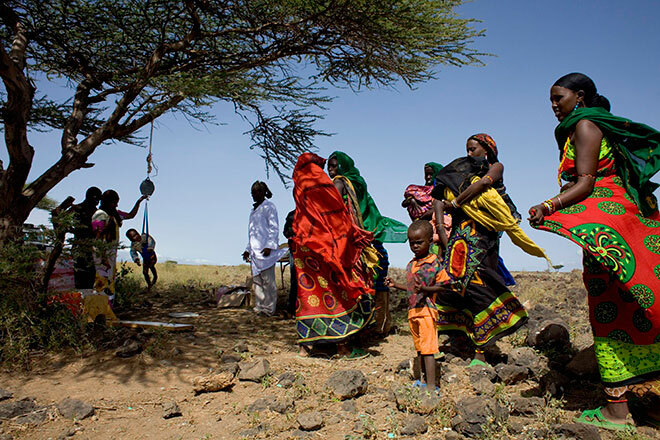 In 2013 I revisited the area with Concern Worldwide to look at the issue of hunger in Kenya. The situation for the Gabbra was remarkably unchanged. 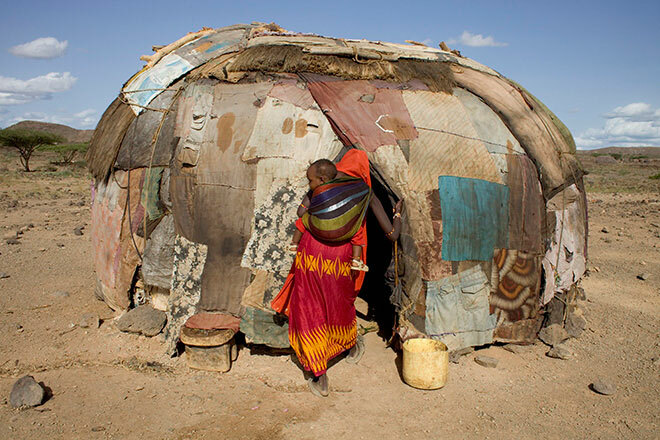 They are still struggling to survive and, as they do so, their rich culture and pastoralist lifestyle is at risk of being lost. 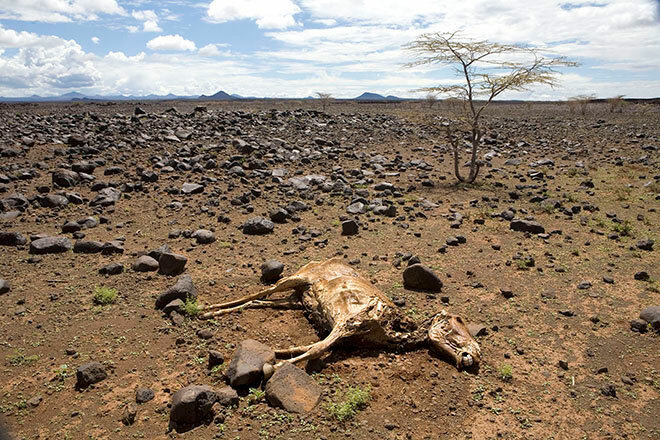 A dead donkey, a victim of the recent drought, lies on the bleak terrain close to Kalacha. 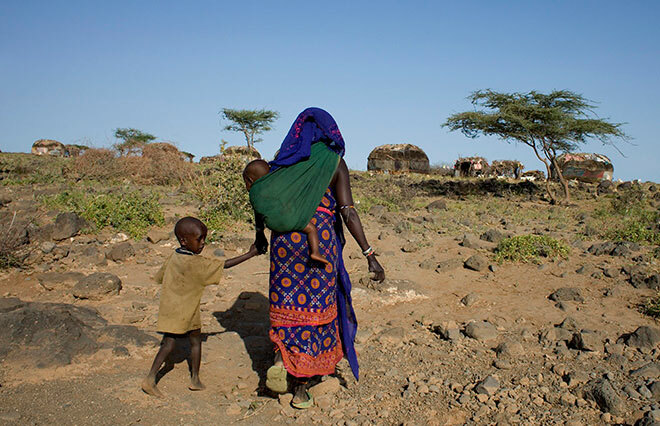 Teso Diba walks back home with her 4-year-old son, Umuro, after a consultation at Concern’s nutrition outreach clinic in Sahgel, Chalbi District in northern Kenya. Umuro had lost weight and was being treated for malnutrition through Concern’s outreach nutrition programme. Concern’s outreach nutrition programme is run in partnership with Kenya’s Ministry of Public Health and Sanitation, and reaches Gabbra communities that would otherwise have no access to healthcare. Women come from surrounding areas to have their children checked and vaccinated. Clinics are held wherever possible: this one, under the shade of an acacia tree. 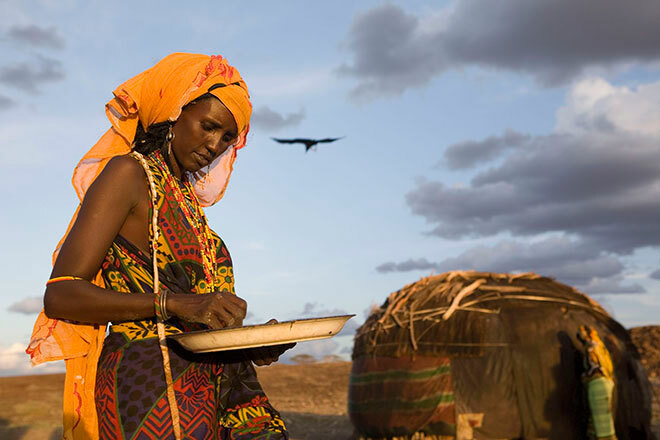 Gabbra’s nomadic pastoralists live in traditional homes known as ‘mandasse’. These are light, dome-shaped tents made of acacia roots and covered with sisal grass mats, textiles and camel hides. A mandasse can be completely disassembled and converted into a camel-carried palanquin, in which children and the elderly travel. A Gabbra pastoralist sorts through some maize kernels, received as food aid in a settlement close to Kalacha. 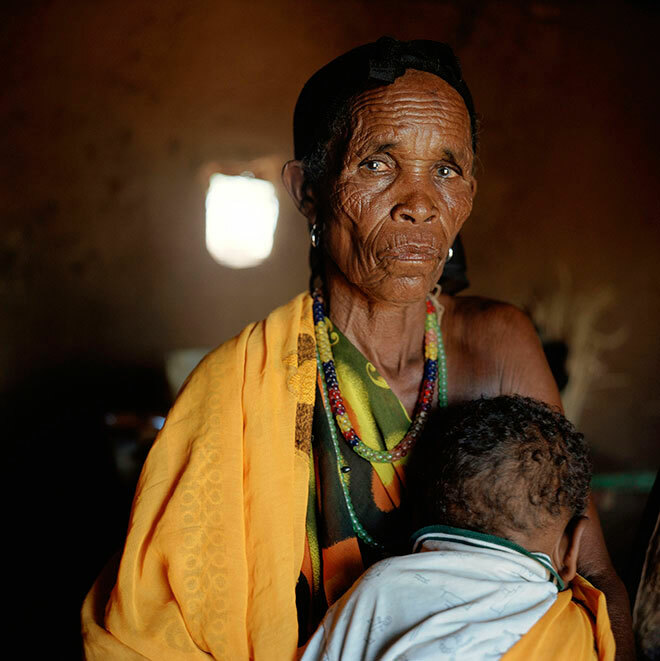 Teso Diba with her son, Umuro, inside her traditional home. Umuro had lost weight because of a lack of food, but now that he was in the outreach nutrition programme he was getting better and stronger. 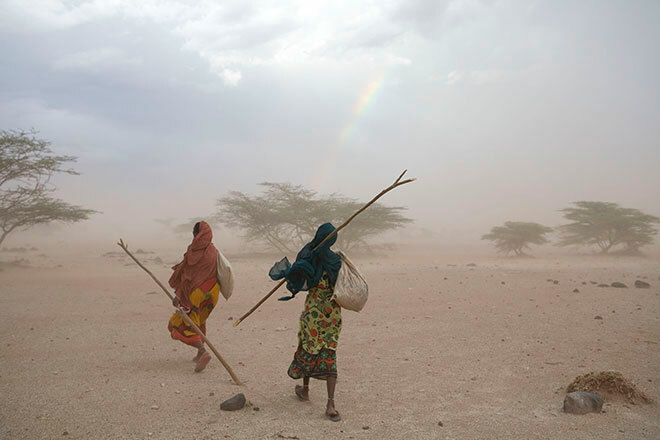 Two Gabbra women, Ilo Jarso and Gonche Salesa, make their way through a dust storm as they seek out forage for their remaining few goats. In the distance, a rainstorm brews and a rainbow is visible. 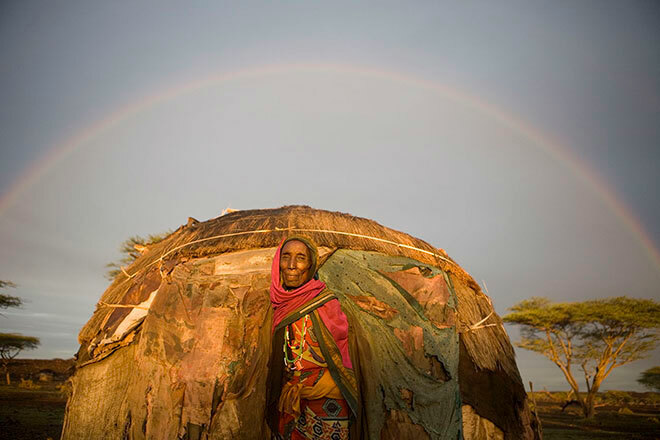 A rainbow looms above 75-year-old pastoralist Shake Abudho as she gazes out of her traditional mandasse in Kalacha. This was shortly after one of the first rainstorms that broke the drought in the region. 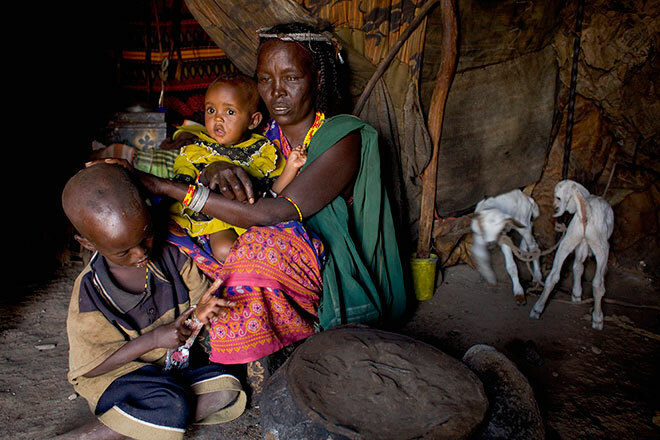 Abudho and her family are only able to avoid starvation thanks to the monthly food supplies they receive. 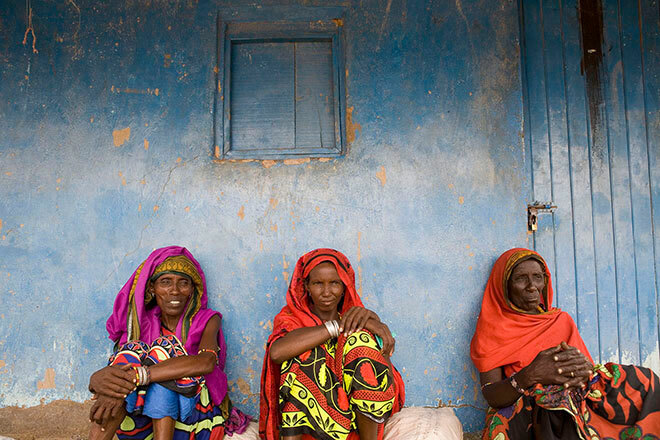 Kame Darasso, Habima Mohamed and Doko Isako, three Gabbra women, wait for their numbers to be called during a food aid distribution in Maikona, another settlement in the area. 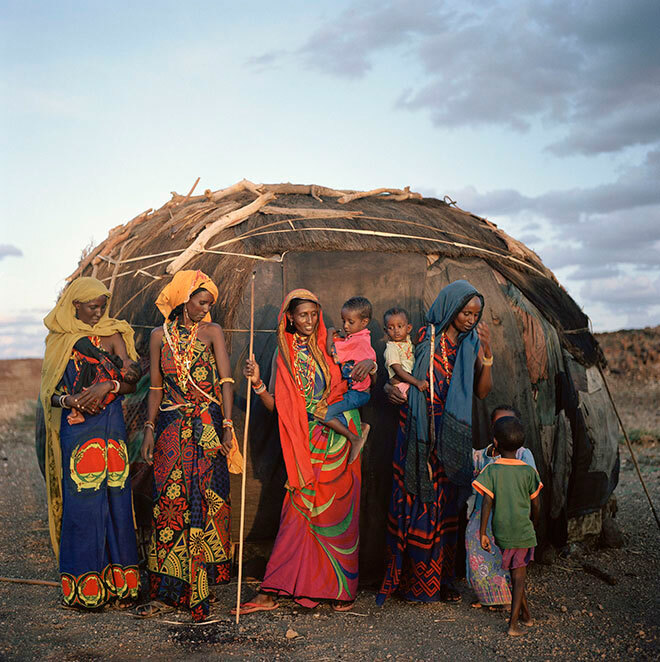 A group of Gabbra women and children stand outside one of their mandasse, which had been set up close to Kalacha. 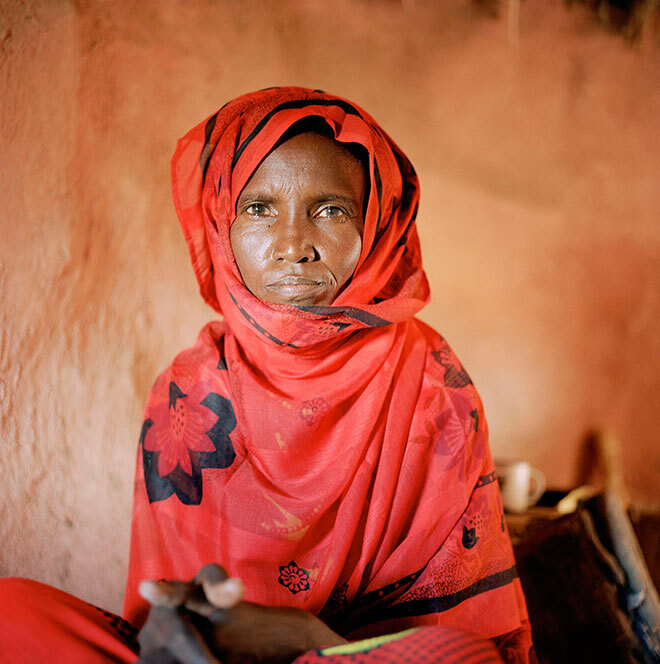 Portrait of Ilo Jarso, a Gabbra pastoralist. Sora Hursa with his wife, Dibo Hursa, and their newborn baby, Amo. Having lost all of their animals in the drought, the family was forced to move to this settlement in Kalacha to be close to food aid. 75-year-old Adhi Kulu sits with her grandson, Guyo, in her small shack in Kalacha. Her two sons had died and she was helping her daughter-in-law care for Guyo. She had lost most of her livestock, so the heavy rains that began to fall in the days after this picture was taken came too late to help her. 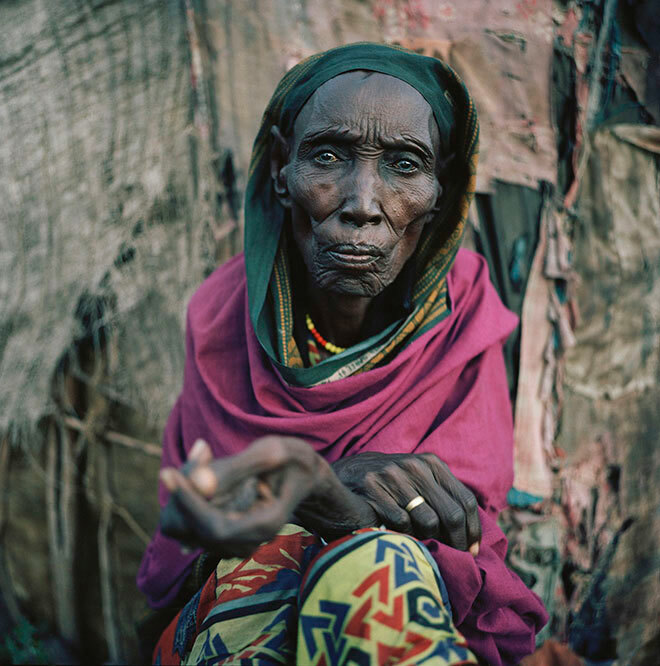 Shake Abudho, 75, sits outside her traditional Gabbra shelter in a satellite camp on the outskirts of Kalacha. Her son had lost all of his animals in the drought. 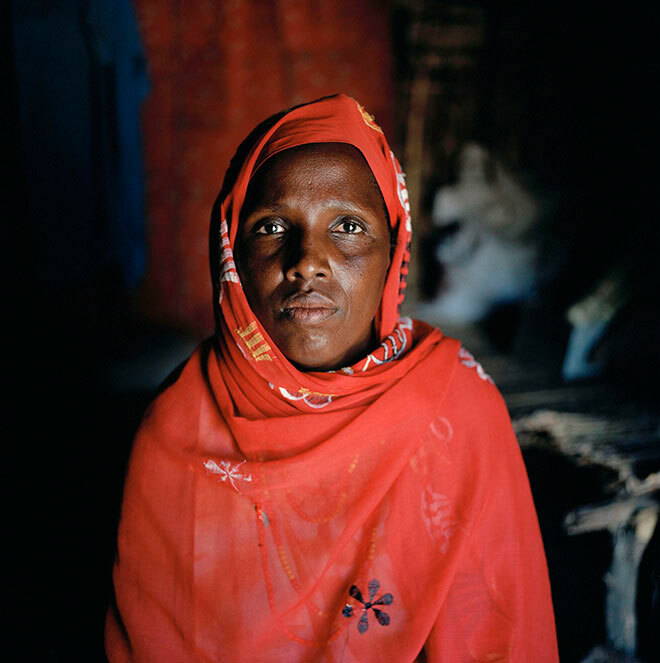 Portrait of Habima Muhamed, 40, a Gabbra pastoralist. She was a single mother and had a mere ten goats left out of a herd of 150.